Great Indian Bustard (GIB) is a large bird with a horizontal body and long bare legs, giving it an ostrich like appearance, this bird is among the heaviest of the flying birds. The GIB lost to the peacock in the race to become national bird of India. Now it is on the verge of extinction due to modernization of agriculture praces and rapid infrastructural developments. 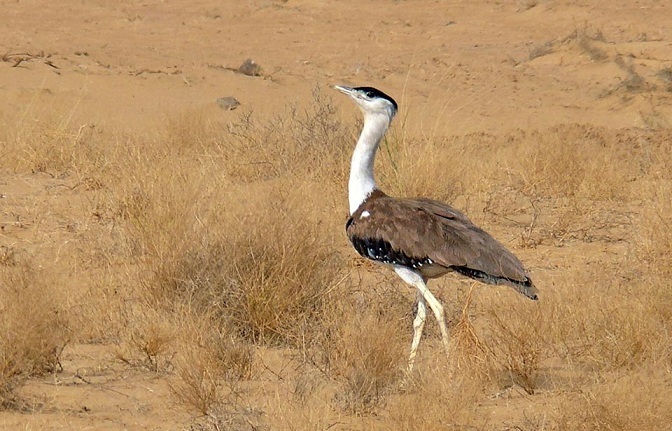 Rajasthan government in collaboration with the Wildlife Institute of India (WII), is formulating a long-term plan to save its state bird,- The Great Indian Bustard (GIB) from extinction . GIB was formerly widespread in India and Pakistan. Presently, 75% of GIB are found in Thar region of Rajasthan, and remaining in Gujarat, Maharashtra, Karnataka and Andhra Pardesh. GIB is listed in Schedule I of the Indian Wildlife (Protection)Act, 1972. GIB is also in the CMS Convention and in Appendix I of CITES. GIB has been classified as Critically Endangered on the IUCN Red List. GIB also forms part of the National Wildlife Action Plan (2002-2016). Karera Wildlife Sanctuary – The species disappeared from Madhya Pardesh in early 90s’. The biggest threat to this species is hunting, which is still prevalent in Pakistan. Habitat loss and alteration as a result of widespread agricultural expansion. Occasional poaching outside Protected Areas. Collisions with high tension electric wires. Rajasthan Government initiated “Project Great Indian Bustard“, on World Environment Day 2013, identifying and fencing off bustard breeding grounds in existing protected areas as well as provide secure breeding enclosures in areas outside protected areas. Humane Society International (India), Wildlife Institute of India and Rajasthan fo rest department are conducting a dog population survey on the outskirts of Jaisalmer as controlling the population of stray dogs is critical to the survival of the Great Indian Bustard. The dog census is being carried out in the critical GIB habitat in the Thar region of Rajasthan. The GIB habitat improvement and conservation breeding programme, to be implemented by the Wildlife Institute of India (WII) in collaboration with the Gujarat, Rajasthan and Maharashtra forest departments, proposes to collect eggs from the wild, transport these to Kutch to build a breeding population and subsequently release captive-bred birds. The Union Geovernemnt has sanctioned Rs 35 crore for five years under the Compensatory Afforestation Fund Management and Planning Authority (CAMPA) for the project. Now, Rajasthan Government had decided not to send eggs to Kutch. Instead, the state forest department has been asked to request the Centre for a breeding and research centre for Rajasthan’s state bird near Jaisalmer in the Desert National Park (DNP). Rajasthan considers that conservation efforts in Gujarat are not efficient as it has lost 90% of its population of GIB in last decade, further Rajasthan has the maximum number of GIB’s and so breeding center should come in Rajasthan only. The experts consider that being close to the coast, the site chosen in Mandvi, Kutch, provides the ideal moisture, temperature and vegetation throughout the year to maximise egg laying in GIB. Jaisalmer might not be the optimal location for a breeding centre because it is too dry and hot to ensure productivity. A similar tussle between Gujarat and Madhya Pradesh appeared to have resolved in April 2013 when the Supreme Court ordered relocation of a few lion prides from the Gir forest to the Kuno wildlife sanctuary to ensure that the endangered species is not confined to a single location. But no action has been taken so far. National Green Tribunal (NGT) in September 2016 banned installation of windmills near Desert National Park (DNP) to protect the Great Indian Bustard. NGT had ordered ban on installation of windmills until the notification of the Eco Sensitive Zone (ESZ) around the park was finalized. Hence, NGT had asked the state government to declare 3,162 sq km around DNP as an eco-sensitive zone. However, the ESZ has still not been notified and installation of windmills continue endangered the population of bustard. In between all the politics, rights of states, it the GIB that is losing its count everyday. The project requires an agreement between the three states and WII and they need to work together as time is running out for the GIB.